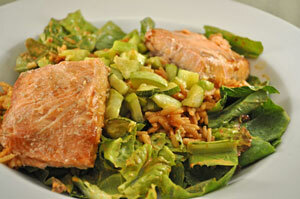 Salmon Salad with Pimiento Dressing, Thyme for Cooking easy recipes. I use pimientos (pimentos) for this dressing; you could also use roasted red peppers. It makes a lot and we'll use the rest for Potato Salad on Sunday. This is a great party menu as everything can be cooked ahead and just assembled and served. Mini Frittatas are very versatile: They can be eaten hot, warm or cold; with a fork or the fingers; seated at the table or wandering around a party. They are great for picnics and any event that needs food prepared in advance. They're good the day you make them and the day after. And they're delicious! Open and drain artichoke hearts. Cut into quarters. Pit the olives if needed and cut in half. Crack the eggs into a large bowl, add oregano, paprika and whisk well. 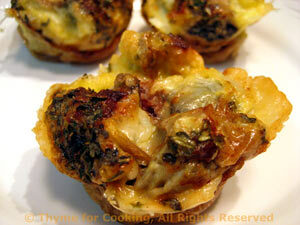 Place the olives, artichokes and cheese in each cup, dividing evenly. Add the eggs evenly to each cup, ladling over the top. Serve with a garnish of olives or artichokes, warm or at room temperature. To pit olives: Place them on a board, lay the blade of a heavy knife flat on top and smack the knife, smashing the olive. This cracks them and the pits can easily be picked out. You could also use a meat pounder. This is a layered salad, with tomato-infused brown rice, shredded, fresh zucchini and roasted or grilled salmon, finished with a red pepper dressing. If you use quick-cooking Brown Rice it all goes together fast. Everything can be cooked ahead and assembled just before serving. Snip the parsley and tarragon. Mix herbs with the salt, oil and spread on the salmon. Bake at 400F 200C) for 15 minutes, or until done. Could also be done on the barbecue grill for about 10 minutes. If done earlier in the day, refrigerate until ready to use. Add garlic and rice and sauté 2 minutes. Uncover, fluff with a fork and set aside - if done earlier in the day, refrigerate until ready to use.